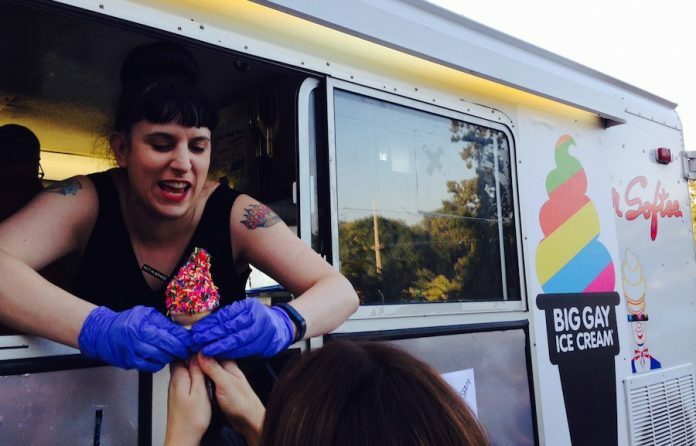 Kat Kinsman, editor in chief of Tasting Table, helped serve some Big Gay Ice Cream over the weekend. Like all good things in the South, it began with lard. A fifteen-course lunch last Saturday led by Houston chef Chris Shepherd of Underbelly started with a cup of gochujang, an umami-rich Korean condiment made out of red chilis, that had been whipped together with pork fat. We smeared the stuff across large, fluffy biscuits, sausage, anything that was within reach. I dreamed of a guchujang lardo smoothie. But then I spotted a tray piled high with fried bologna and Chinese steamed buns making its way down the long communal table. The combination didn’t take me to China, the home of my grandparents. Nor to Memphis, my birthplace. It took me to some place in between, a place that graphed together my cultural roots, a place I didn’t know existed. For a brief moment, I stared at the sandwich in my hand. Pol Pol would love this. In many ways, that epic lunch—thoughtful and ripe with surprises—was the tone of the entire 17th Southern Foodways Alliance symposium held in Oxford, Mississippi. “Who is Welcome at the Welcome Table?” was this year’s theme in conjunction with the 50th anniversary of the Civil Rights Acts. Four hundred or so tickets sold out in a record three minutes. Chefs, critics, writers, anyone who attended—they’ll agree: The four-day agenda was packed with heavy discussions. We heard from Ta-Nehisi Coates, author of The Case for Reparations, a brilliant piece on the history and consequences of injustices against blacks in America. We heard Chris Offutt, an award-winning writer from Appalachia in eastern Kentucky, speak candidly about the connection between food, class, and shame. We heard from Todd Kliman, a food critic for the Washingtonian who asked why D.C.’s best restaurants rarely had black customers. We heard from Ben Mims, a cookbook author and Mississippi native who found a home in his layer cakes after coming out to parents who immediately rejected him. We heard from Joseph “Piko” Ewoodzie, a sociologist and third-year graduate student at the University of Wisconsin who shadowed homeless people to understand how they acquired food. This past weekend wasn’t just about gorging on great food (of which there was plenty), drinking (there were bathtubs—literally—of alcohol), or networking. The weekend felt like a call to arms, a time to pause, for a brief moment, and reflect on the issues that permeate our newsrooms, kitchens, fields, and homes. And although this was my first symposium (I was honored to be invited by the SFA and attend as a fellow with three others), tackling these hard topics felt oddly natural around so many strangers—loving, passionate, brilliant strangers who cried together, laughed together, and welcomed me to join them like an old friend.